In honor of International Women's Day, Erin Bagwell, founder of Feminist Wednesday, released the trailer for Dream, Girl, a documentary film "redefining what it means to be a boss by telling the stories of female entrepreneurs." 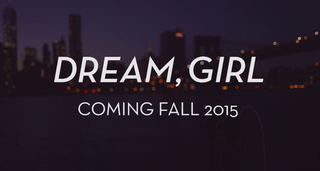 The project was initially funded through Kickstarter, and it looks like there are still many moving parts in gear to bring Dream, Girl to fruition. I especially love a portion of the Kickstarter preview video (viewable in the link above) at the 2:12 mark, where a woman named Mariama refers to shattering glass ceilings with this analogy: "It's like a door. If you come to open it and it's locked, you break it."